Superheroes have everything that (corporate) Hollywood loves – for better and for worse: a pre-existing and loyal fan base, franchise potential, visual 3D extravaganza potential, merchandise and amusement park revenue streams, undemanding plot logic requirements, easy formulaic scripts, predictable humor and much more. On the other hand, the cost of differentiating them is increasing beyond the ability of small players, which are gradually disappearing in this consolidating landscape. 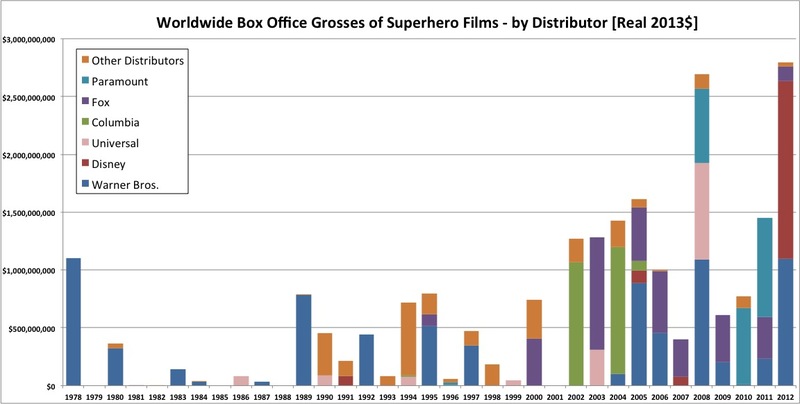 This has been the decade of the superhero, and more specifically – the decade of Marvel’s superheroes. DC Comics, which is owned by Warner Bros., is still hanging in there, but they have only managed to capitalize on two key franchises – Batman and Superman. The first had a very good run with Christopher Nolan, but that’s over now and the latter is being rebooted these days – and doesn’t seem to be of the same scale. You would think that since the Disney-Marvel merger of 2009, Disney would shoot forward as the leading distributor in this domain, but apparently (according to this article) – so many of the Marvel characters are tangled up in very complex licensing deals with all the other studios, so it will be years before Disney will be able to fully capitalize on its Marvel assets in the way WB is doing with DC Comics. But once the lawyers get paid, or once the current licensing agreements expire – we will probably see Disney emerge as the dominant Superhero player. WB & DC will always be relevant, but it looks like Marvel is doing a much better job at leveraging its arsenal of characters. In any case, the domain of superheroes is consolidating. On the publishers’ front – the past decade and the decade to come will be dominated by Marvel. Most of the leftovers will go to DC Comics, but all the smaller players will have a much harder time, as these productions become more and more extravagant and expensive to produce and market. « 22. SHOW ME THE STARTUPS!